Retired Smithfield police officers, Ray Trombley, (Left), and Jim McVey, (Right), recall what it was like to serve and protect in a time before modern police technology. The pitch and wail of police sirens echoed in the night as a caravan of cruisers snaked through the streets of Providence in hot pursuit of a stolen Cadillac. Blue lights reflected off storefront windows as tires screeched and cars careened around corners. The Cadillac made its way onto Route 95 towards East Providence driving the wrong way against highway traffic at speeds topping 90 miles-per-hour! The cruisers followed. Leading the procession were Smithfield Officers Raymond Trombley and Joseph Parenteau who had initiated the chase. When they reached the Washington Bridge the Cadillac and cruisers crossed into the eastbound lane. In the distance ahead Trombley saw a police roadblock and as the Cadillac barreled forward the sound of gunshots rang out. It was the late 1960s, and even though nearly fifty years have passed since that incident, Ray can still recall the license plate on that Cadillac – GX-222. Trombley and Parenteau had been patrolling Douglas Pike on the midnight shift when they noticed the Cadillac with two youths inside. They activated the cruiser lights, but the driver refused to stop and fled in the direction of North Providence. In the vicinity of Twin River Road the officers tried to force the Cadillac to the side of the road by pulling abreast of it, but the driver swerved at the cruiser trying to ram it. As the pursuit entered North Providence, and then Providence, cruisers from those jurisdictions joined in. The Cadillac was finally cornered in the town of Warren where it was discovered that the two occupants were escapees from the Rhode Island Training School. Such multi-jurisdictional high-speed pursuits involving gunfire are rare today, but there was a time when such things weren’t uncommon; when officers could chase a vehicle for virtually any reason and “warning shots” were allowed. 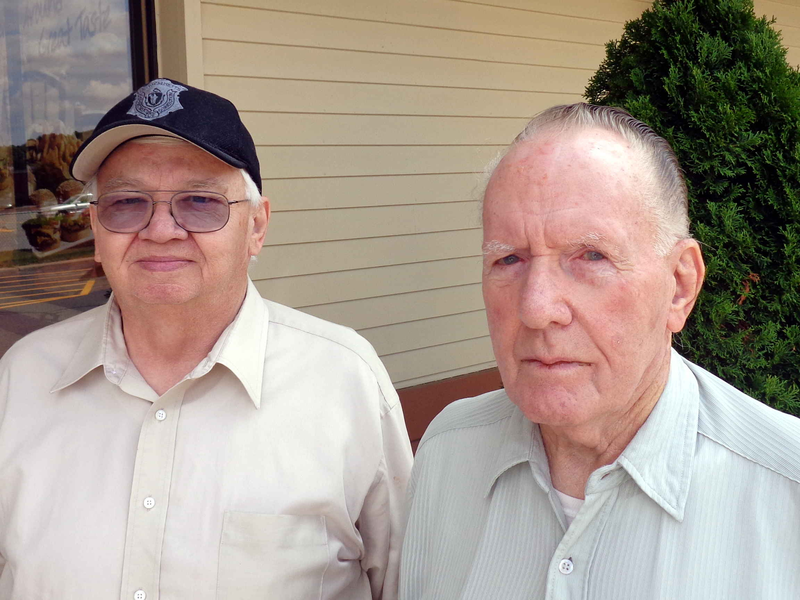 Police work has changed drastically since then, and recently Smithfield’s two longest retired police officers, James McVey, and Raymond Trombley, got together to recall what it was like to be a town policeman in those bygone days. Prior to the completion of Route 295 in the mid 1970s, Smithfield’s population was roughly several thousand people, so the officer on the beat knew most everybody, and they knew him. In many ways Smithfield was still a small town. In the 1950s the department only had one cruiser which was equipped with a one-way police radio that could receive, but not transmit. Therefore, officers always carried a quantity of dimes to use in payphones in case they needed to call the station, which in those days was located in the Town Hall. The station, by the way, wasn’t manned 24 hours like it is today. Dispatching in those days could be described as “hit or miss”. The police station had a dispatch radio, as did the Chief’s house. The station was “Station A”, and the Chief’s house was “Station B”, and sometimes calls were dispatched from either location. The chief’s house also had an extension phone from the Town Hall, so that if nobody was in the station, the chief or his wife would pick up and take the call. Unfortunately, the radio at the chief’s house had limited transmission capabilities – only 14 watts. On other occasions a call might come through from the State Police barracks in Scituate. They would put out a broadcast such as “Attention Smithfield Police, respond to…” The message would be repeated three times. Since an officer couldn’t acknowledge via radio, the State Police never knew for sure if the call had been received, and sometimes they weren’t. Such a system might seem archaic today, but even a one-way radio was a vast improvement over the days of no radios. At that time the farm had on its property a small professional fireworks factory. Unbeknownst to Young and McVey, lightning had struck the building setting off an explosion. Due to storm related problems, Young and McVey never received a radio call of the incident. When Ray Trombley joined the department on December 13, 1964, the roster consisted of thirteen full-time officers and a cadre of “reserves”. “I was the thirteenth officer.” he recalled. By then the fleet of cruisers had grown to three – Cars 193, 194, and 195, as designated by the police license plates, and each was equipped with two-way radios – a significant improvement. The day and second shifts used two patrol cars, each patrolling one-half of the town, but the midnight shift used only one car with two officers patrolling the entire town. This was done for safety reasons, which is why he and Joe Parenteau were riding together the night of the chase. And with only three cars for the entire department, one might understand why the chief was upset over the blown motor. Both Jim and Ray enjoyed two-man patrol cars for it gave them someone to talk to when things were slow – “Unless the other guy was a smoker”, Ray said with a laugh. Ray recalled that all he had to do before going on patrol for the first time was qualify with his department issued pistol – a World War II vintage .38 caliber revolver. Going to the academy would come later. As to police cars, Jim remembered that early cruisers had manual-shift transmissions which were difficult to operate at low speeds while creeping around buildings at night. “Trying to shift, steer, and operate the hand-held spotlight all at the same time was difficult.” He said. Luxuries such as automatic-transmissions, and air conditioning for Smithfield’s police cars didn’t come until much later. Those early patrol cars also lacked protective cages to separate an arrestee from the officer. That situation was rectified after a patrolman was involved in an accident while transporting a prisoner. While speaking of accidents, one may be surprised to learn that Smithfield’s roadways have borne witness of many horrific car wrecks over the years. Police work has always been inherently dangerous, and even simpler times weren’t necessarily gentler. A case in point involved a time in 1952 when Jim stopped a car with Connecticut plates on Washington Highway. He only intended to give the juvenile driver a warning until he learned the car was stolen. The youth was transported to the State Police barracks in Lincoln where it was further learned that he was wanted for shooting at a Norwich police officer! When a Connecticut trooper and Norwich officer arrived to take custody of the prisoner, the Norwich officer asked where the gun was. “I tossed it out at the state line” was the reply. “Tell the Smithfield officer what you would have done with the gun if you still had it” the officer ordered. In another incident Jim recalled the night of May 19, 1961, when he pursued a stolen Pontiac with two men inside who tried to break into Cole’s TV on Route 44. The chase continued along Putnam Pike and into Glocester where Jim fired a warning shot from his service revolver blowing out the Pontiac’s rear window. Speeds were in excess of 100 mph, and as glass from the window blew backwards it peppered the front of the police car causing small leaks in the radiator. As the cruiser began loosing coolant, the chase roared through Chepachet where a state trooper joined in. Everything came to an abrupt end at Jackson Schoolhouse Road where the driver of the Pontiac lost control and crashed. Subsequent investigation revealed that both men were armed, and had broken into several other businesses that night in Johnston and Providence. Today’s officers have computers in their cruisers that allow for instant information on vehicle and criminal data, but in the 1950s and 60s such was not the case. When dealing with suspicious persons or vehicles and officer had to rely more on instinct and judgment. One tool at their disposal was the state’s “two-hour-hold law” which allowed an officer to arrest a person for two hours while a follow-up investigation was done. This law has since been repealed, but at one time it was a valuable asset to police work. Police officers in the 1950s and 60s made far less than other occupations. Jim worked nine-hour days, 54 hours per week, all for $42.00 before taxes, and officers didn’t receive overtime. By the 1960s Ray had it a little better working 44 hours a week and taking home about $78.00 gross. To help make ends meet, he took a second job at Cavanaugh Company in Greenville. As to time off, a Smithfield patrolman in the 1960s got one-and-a-half days off each week. Ray said some officers would work out a schedule between themselves filling in for each other on the half-day so one week they would have one day off, but the next they would have two full days off. Only the most senior ranking officers got weekends off. Ray’s days off were generally Monday and Tuesday. By the 1970s the department had outgrown its Town Hall accommodations, and both Jim and Ray played a role in making the current police station a reality. Since then, the department has grown far beyond what anyone could have imagined in the 1950s, and is once again facing a similar situation. Jim retired as Deputy Chief in 1977, and Ray in 1984 as a Captain. Sometimes they still miss police work, for the job is like no other, and they loved doing it. Despite that, having worked in the era that they did, each doubted they would want to go into law enforcement today. The world has changed, and the way they were trained for the job might not fit today’s way of doing things. Modern police officers are forced to operate under restrictions and mandates that weren’t a consideration when Jim and Ray wore a badge.